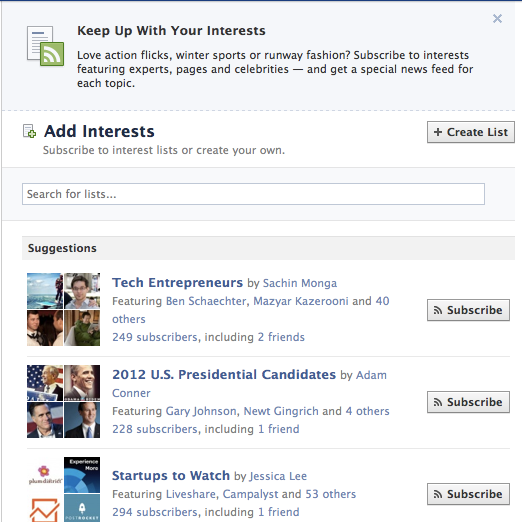 To be filed in the “Don’t Get Too Comfortable on Facebook” bin: Facebook has just launched Interest Lists. 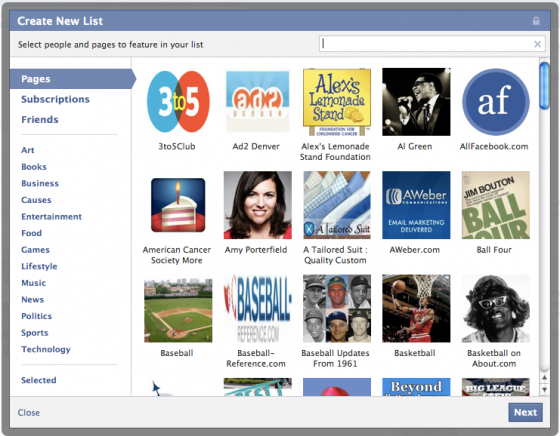 Facebook Interest Lists are a way to organize content in your News Feed by topic or industry. This is not to be confused with Lists, which allow you to target your messaging to particular groups. Regular Lists focus on outgoing content while Interest Lists organize your incoming content. While you could view content based on your Lists before (view only the recent updates from your Good Friends, for example), there was no way to group subscription content or Pages into individual lists. Now that’s changed. You are now presented with a screen that recommends some Interest Lists for you and also allows you to search for Interest Lists by topic. You can subscribe to any of the public Interest Lists or create your own. 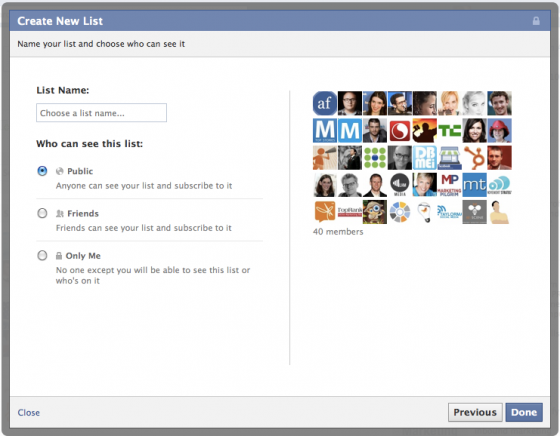 To add to your Interest List, you can sort through your own Pages, Subscriptions and Friends, or you can look through some people and pages that Facebook recommends by filtering by category. You can also search by key word. After selecting the people and pages you want on your Interest List, click Next. Now you get to name it and choose who gets to see it. If you want your friends to be able to see and subscribe to your Interest Lists, set it to Friends. If you want everyone to be able to see and subscribe, set it to Public. If you don’t want anyone to see it but you, set it to Only Me. Keep in mind that privacy settings always apply. So if you create an Interest List that includes your friend Bob who only posts for Friends to see, nothing changes. I may subscribe to your Interest List with Bob on it, but I won’t see any of his posts if I’m not his friend. 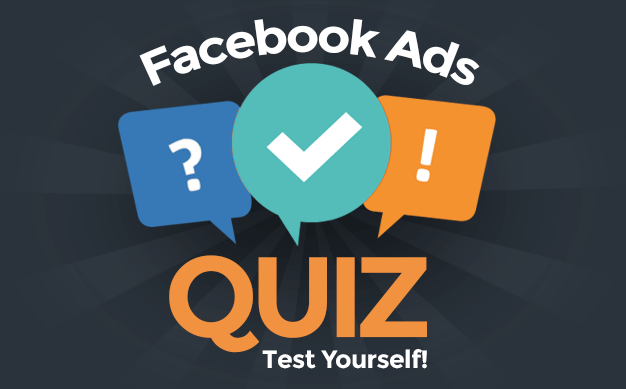 Now, there are a ton of things you can do to leverage this if you’re a brand or marketer. I’ll get to that in another tutorial! What do you think of Interest Lists? Have you created or subscribed to any?